Dr. Sigmon remains on the cutting edge of dental technology and is pleased to offer his patients ClearCorrect™ invisible aligners. These advanced orthodontics allow you to straighten mildly crowded or gapped teeth in only a few weeks. After taking photos and impressions, clear thermoplastic aligners are made to fit over your teeth and gently move your teeth to their new positions. Total treatment time will vary based on your needs and goals. This is a great way to make small corrections that bring out a beautiful smile! 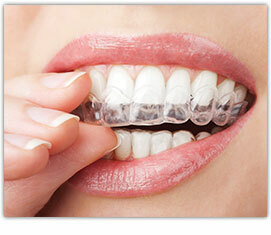 Transparency: Since they are nearly invisible, no one will know you are in the process of straightening your teeth. Comfort: They are very comfortable to wear – there are no metal parts, wires, or headgear that cause irritation or discomfort. Furthermore, you will experience less time in the dentist’s chair because they do not need adjustment. Convenience: You can wear them all day and while asleep – just take them out as needed for eating and teeth cleaning. A straighter smile is just a phone call away! Contact us for a no cost/no obligation consultation at (828) 322-6226 to determine if you’re a candidate for Realine.